What makes this salsa are three secret ingredients: celery, honey and red wine vinegar. 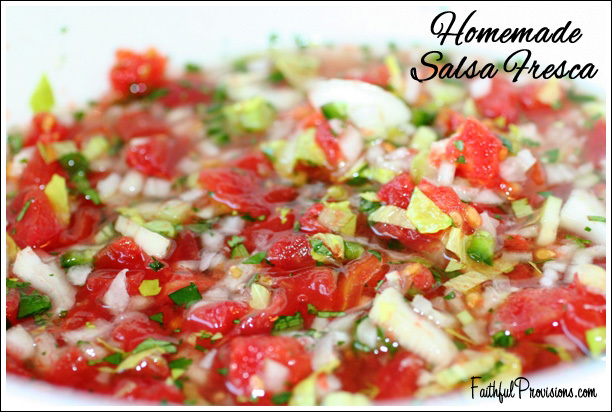 The thing I love the most about this salsa is that it uses a lot of inexpensive ingredients, many of which I already have on hand. The ideal time to make this salsa is when tomatoes are at their peak — which is the end of the summer. However, I have found that a can of diced tomatoes does very well as a substitute for a wonderful year-round option. Combine all ingredients and let sit a few hours before serving. Alternatively, place salsa in a plastic container and freeze up to 6 months. Thaw in sink of cold water for 1-2 hours. Once making this you will find there is an abundance of “juice” from the tomatoes after you have gobbled down the salsa. I love to save it and use it as a base to make another batch. It adds to the salsa’s depth of flavor, which only gets better the longer the ingredients all sit together. Or even better use the leftover juice as a meat marinade for a flank steak. Oh yeah, another huge plus to this salsa recipe is that it freezes incredibly well. So instead of running to the store and having to pay close to $4 for a container of fresh salsa, you can make a bunch ahead of time and freeze it for later. Thanks for sharing your original recipe – looking forward to making this salsa.